Hall of Fame manager Tommy Lasorda hospitalized, but could be released soon. A Dodgers spokesperson said that Hall of Fame manager Tommy Lasorda is “doing fine” after spending about a week in the hospital with back and shoulder issues. Lasorda could be released from the hospital as early as tomorrow, according to the club. 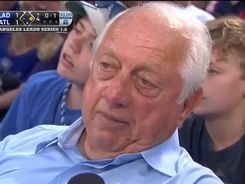 Lasorda, 89, has not attended either Game 3 or 4 of the National League Division Series at Dodger Stadium. The Dodgers’ media guide lists Lasorda as a special advisor to chairman Mark Walter. Watch: Mike Piazza thanks Dodgers organization in Hall of Fame induction speech. In his Hall of Fame induction speech Sunday, former Dodgers catcher Mike Piazza said he “will always be truly grateful” to the organization that drafted him and employed him from 1988 to 1998. Piazza thanked Tommy Lasorda, his first owner, Walter O’Malley, former hitting coach Reggie Smith and former Dodgers teammate Eric Karros, among others he singled out by name. The last phone call he received was from Tommy Lasorda. A local World War II veteran wanted to meet Tommy Lasorda before he died. Clifford Rich, 90, crossed the item off his bucket list recently when Lasorda called to chat; he died the following day. Here is the touching story from colleague Dennis McCarthy. Clayton Kershaw is not Tommy Lasorda’s National League MVP. Former Dodgers manager Tommy Lasorda tends to speak his mind with a microphone in his face. Tommy Lasorda doesn’t have an MVP vote. If he did, the former Dodgers manager — and former pitcher — wouldn’t vote for Clayton Kershaw. Considering his effervescent love for all things Dodgers, it was a surprising sentiment from the 87-year-old Hall of Famer. The question arose Monday when Todd Hollandsworth — who won the NL Rookie of the Year award in 1996, when he played for Lasorda — was interviewing Lasorda for MLB Network Radio on SiriusXM. The MVP award winners from both leagues will be announced Thursday. Watch: Tommy Lasorda fetes heroic Dodgers fan on ‘Jimmy Kimmel Live’. Remember the man wearing a Dodgers hat who rescued an older man from a burning building in Fresno recently? Sure you do.